Born at Earls Barton, came to Rushden as a small boy. Emigrated aged 17, enlisted at Warruambool, Victoria, Australia. 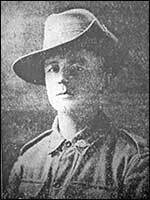 When Frank enlisted on 24th February 1916, aged 19 years and 5 months, he was in Warruambool, Victoria, Australia, but said he had been born at Rushden. He was 5'5½" tall, chest 31-34", weighed 120 pounds, had grey/blue eyes, brown hair, and followed the Wesleyan faith. He left via Alexandria on 6th June 1916 and landed at Plymouth, England on the 16th, for training at Camp 28, Lark Hill, Salisbury Plain. He went to France on the 12th of September 1916 where he joined the 29th Battalion ten days later. On 17th December he was hospitalised with diarrhoea but was discharged back to duty on the fourth day, but on the following day he was admitted again as a casualty. He was granted leave to England from the 1st - 14th September 1917, and a month later he was killed in action, and buried at Broodseinde. His mother signed for his effects on 28th March 1918. We regret to record the death in action of Pte Frank Osborne, aged 26, of the Australian Contingent. The deceased was the youngest son of Mr Wm James Osborne, dairyman, etc, of the Court Estate, Newton-road, Rushden. As a boy the deceased was a scholar in the Newton-road Council School, Rushden, and he also attended the Park-road Wesleyan Sunday school and the Band of Hope. After leaving school he worked for a time at Mr C Horrell's factory, and was subsequently employed by Messrs. Robinson Brothers, Roberts-street. Then he had 18 months' training on the land preparatory to going to Australia. On October 12th, 1914, he went to Victoria, Australia, to take up an appointment on a dairy farm, about 170 miles from Melbourne, and it is a sad coincidence that it was three years afterwards to the day that he met his death. "Belgium, October 19th, 1917. Dear Mrs Osborne, - It is my painful duty to write to you and inform you of the death of your son, No. 2971, Pte F Osborne, of my Company. He was killed in action on October 12th, in Flanders. It may be some little consolation to you to know that he suffered no pain at all, and he fell while doing his duty. He was a runner in the Company, and was one of the bravest and most fearless fellows I ever knew. He was admired by all with whom he came in contact, and he is sadly missed throughout the whole battalion, as he was most popular with officers and men alike. He is buried somewhere near where he fell, and I have had a cross erected over his grave. It is hard that one so young and bright should be taken from you in the prime of life, but he died a hero's death, fighting for his country and the right. No man can do more than this. All the Company join with me in offering you our deepest sympathy. -Yours on duty, H. S. Gray, Lieut." The services of the late Pte Osborne as a "runner" were highly valued, as he showed unusual abilities in this capacity, being able to find trenches, etc, in the dark. The deceased soldier's parents, Mr and Mrs W J Osborne, removed to the Court Estate in 1904, having formerly lived in Winchester-road, Rushden, and before that in Earls Barton. Sympathetic reference to the death of Pte Osborne was made at the Park-road Wesleyan Church on Sunday. At the meeting of he Rushden Wesleyan Guild on Tuesday evening it was decided to send an expression of sympathy to Miss Florrie Osborne (the deceased soldier's sister), who is a member of the Guild. 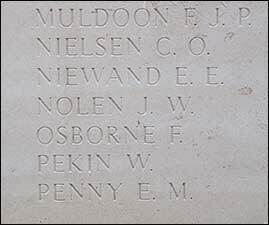 Mr W J Osborne, dairyman, of the Court Estate, Newton-road, Rushden, has now received official confirmation of the sad news of the death of his younger son, Pte Frank Osborne, of the Australian Contingent. Dear Miss Osborne - Your letter of Oct. 25 just to hand. I will be only too pleased to get one of your brother's mates to write to your mother. You asked for any further particulars of Frank's death. Well, he being a runner, he was always near me. He had been out on different runs during that morning, and the shelling was very severe. As he came in from the last run I remarked to him that he must have had a bad run, but he made very light of it, and said he would never be hit. Later on, when the shelling had practically ceased, he went out again, having to go only thirty yards. He had just gone about ten yards outside my dug-out, when a chance shell killed him and his beast friend, Lance-Corpl Stephenson. Everyone admired Frank, and there was no-one in the whole battalion who was more popular. He had a very winning way about him, and was always the first to oblige in anything. I always admired him for his bright, jolly manner, and his ready will. I never met anyone who was as fearless as he; I had remarked on it many times and he took a keen delight in all his work. I suppose most people think that all men are alike to their officers, but I can assure you that such is not the case and I knew Frank to be one of the very best. This death caused me more sorrow than any other we have had in the company, and I know what a terrible blow, it must have been to his loved ones. If there is anything else I could do in any way, in would be only to pleased to be of the slightest assistance to you. - Again expressing my deepest sympathy, I remain, yours on duty, H. S. Gray."